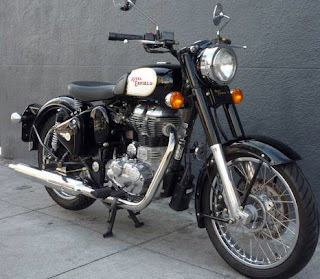 This Royal Enfield for sale in San Francisco comes with an attitude. Attitude is everything when it comes to motorcycles. There is one attitude in particular that strikes me as particularly appropriate for Royal Enfield motorcycles. The seller of this pretty Royal Enfield C5 in San Francisco, Calif. captured it pretty well. "Couple of scratches on the tank (pics might show'em). What's an Enfield without scratches?!? Right?!? Right." To me the new Royal Enfields are vintage style motorcycles, built close enough to the way they were "back in the day" to justify mentally rolling back the clock to 1955 while you ride. If nothing else, you will be travelling at speeds that were appropriate in 1955. And, yet, you don't have to treat one like a museum piece out for a parade once a year. It's not rare. They're building them by the tens of thousands in India and show no signs of stopping anytime soon. I'm happy to admire motorcycles restored and maintained to the heights of perfection. I'd be terrified to ride one. This seller, Munroe Motors of San Francisco, isn't making excuses for the bike; they seem to have adjusted the asking price ($4,995) to reflect its condition. I've never seen the bike and can't vouch for it, but if I was in the market, a few battle scars wouldn't bother me (the lack of a kick starter might). "If nothing else, you will be travelling at speeds that were appropriate in 1955." Or not! I commute on my B5. On Interstate 10. Through Houston. I normally keep it to an indicated 70mph (true 65), but depending on traffic flow I often wander over a true 70 at times, especially on the way home. Part of the reason I bought it is it's ability to function a modern "practical" motorcycle. And that's my personal reason for not worrying about scratches. I do feel guilty for not washing it more often than every 6 months. I like old bikes to have a "patina of use" - not restored to jewel-like perfection, which would preclude actually riding the things. As someone who has come through a prostate op I thoroughly agree about the lack of a kick-start though!